On November 6, the United States will have its first major election since Donald Trump was elected President in 2016. While Trump himself will not face a vote for another two years, most of his colleagues in the Republican Party will be tested at the polls this Tuesday. This election gives the American people a chance to check the President’s power and popularity. The outcome of these midterms will either give Trump a mandate to continue to push his right-wing agenda, or it will allow the opposing Democratic party to stymie his efforts. Moreover, this round of midterm elections gives the U.S. voters the opportunity to change the current balance of power in the Congress, especially in the House of Representatives, and accordingly to put an end to the period of “unified government” under the presidency of Donald Trump. 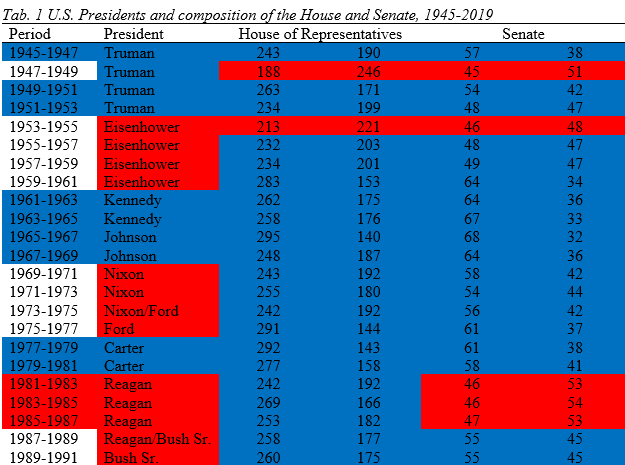 As shown in Table 1, the “divided government”, with the separation of power between representatives of different parties in the White House and the Congress, has been the rule in the U.S. history since the presidential election of Ronald Reagan in 1980. Differently put, in the last forty years the government in the United States has been split between different majorities (Democrats vs. Republicans) for about 30 years, that is the 75 percent of the time. The name “midterm election” is derived from its timing. The vote takes place in the middle of the President’s four-year tenure in office. Again, the President is not up for election, but the vast majority of Congress is. America’s Congress is divided into two co-equal, symmetric branches, the House of Representatives and the Senate. The House has 435 members that each serve two-year terms. Each of the 50 states is given a certain number of representatives to send to the House based on their population size. California, with a population nearing 40 million, has 53 representatives. Wyoming, on the other hand, with a population just under 600,000, only sends one representative to the House. States that are allocated more than one House member divide into districts based on location within the state. Each district is roughly a similar size in population, and they each elect one representative. The Senate treats all 50 states as equals when it comes to representation. Each state is given the chance to elect two Senators, no matter their size or importance. States do not divide into districts, Senate campaigns are always statewide. In this body, Wyoming and California are treated as equals, even though California has a larger population by a factor of 67/1. Members of the House serve two-year terms after elections, and Senators serve six years. Congressional elections happen every other year, so all 435 seats in the House are up for grabs (although, it is the rule that an overwhelming majority of incumbents will be reelected to their same seats). In each election cycle, about one-third of the Senate faces an election. This year, there are 35 Senators on ballots around the nation. Donald Trump and his Republicans have enjoyed full control of the legislative process over the past two years. As Fig. 1 shows, Republicans control the Presidency and majorities in the House and Senate. For a bill to be made into a law, it has first to be voted by Congress. Simple majorities in both the House and the Senate need to debate and approve the bill. Once it has passed Congress, it gets sent to the President to review. The President either signs the bill into law, or vetoes it. Fig. 1 Current makeup of Congress, before the 2018 election Source: CNN. In this recent period of full Republican control, conservative legislation has easily found its way through the historically difficult process. Most notably, Republicans passed massive tax cuts (which increased the debt by $1.5T, but decreased the corporate tax rate to 20%) without a single vote from the hundreds of Democrats in either chamber. If Democrats are able to gain a majority in either the House or Senate, even if it is just by one member, they would gain significant power in stopping heavily conservative legislation from passing. The restoration of a situation of “divided government” would make it difficult for Trump and the Republicans to fulfill their right-wing policy goals, and it would force them to compromise with an angry Democratic coalition. Candidates on both sides of the aisle have hyped the relevance of these midterm elections. Donald Trump, for instance, declared that this electoral occasion “May be the most important midterm election that anybody can remember”. On the Democratic side, former President Barack Obama said that it would be “Profoundly dangerous to this country, to our democracy” not to vote in these elections, particularly for those voters who are worried about Trump and his decisions in office. The attention both politicians and the media are paying to these midterm elections, along with other state-level factors, have provided some evidence of a possible surge in voter turnout this year. For example, a single-day record of 800,000 people registered to vote on National Voter Registration Day in September. This upward trend in registration (and by extension: predicted turnout) may be due to the new wave of activism shown by the young voters, who more than ever appear to be willing to take to the electoral process. According to a recent Harvard Poll, “Young Americans are significantly more likely to vote in the upcoming midterm elections compared to 2010 and 2014”. Overall, 40% of young people under 30 report that they will “definitely vote” in the midterms, with 54 percent of Democrats, 43 percent of Republicans and 24 percent of Independents considered likely voters. All these factors may contribute to a historically high turnout in these midterm elections, especially among the younger generations. This positive trend can also be observed in the turnout for this year’s primaries in both the House and Senate. According to a recent study by the Pew Research Center, nearly a fifth (19.6%) of registered voters – about 37 million – cast ballots in House primary elections, and 22.2% of voters did the same for the Senate. These figures reveal a sharp increase in voter turnout, which corresponds to 4.2 points in House primaries and 5.6 points in Senate primaries (see Fig. 2). 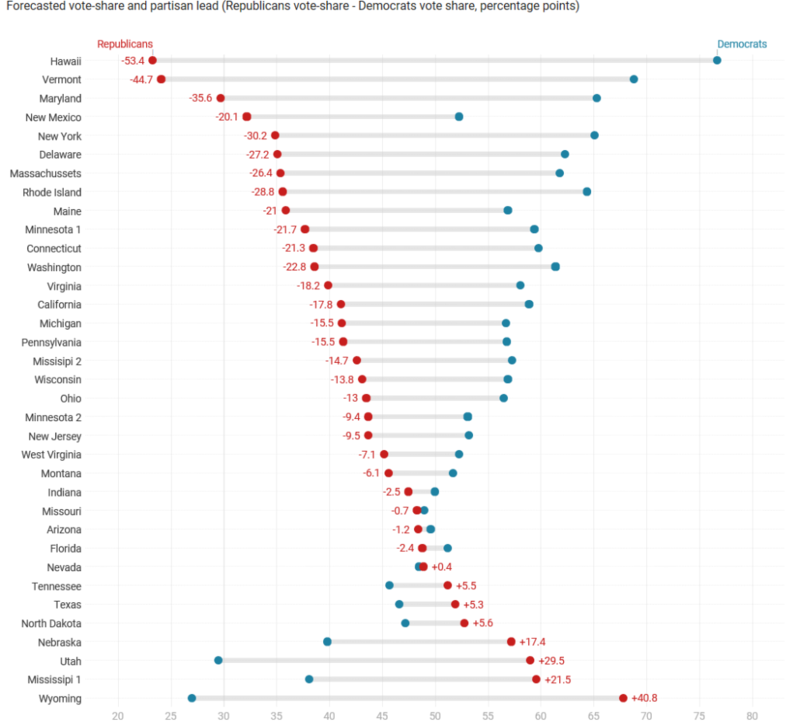 Although the rules governing primaries vary a great deal from state to state, the comparison between voter turnout for this year’s primaries shows a clear upward trend that can bring about a spillover effect on the midterm (general) elections. Source: Authors’ own compilation on data by Pew Research Center. 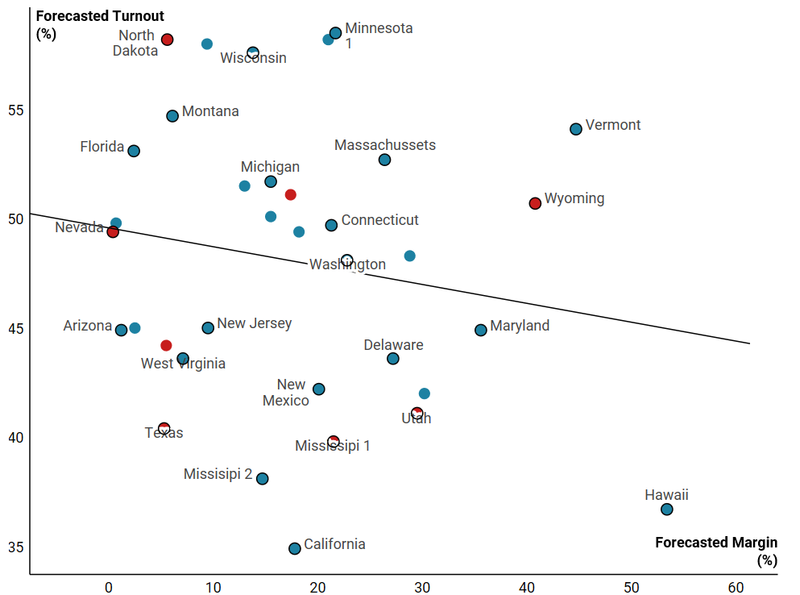 Overall, aggregate voter turnout in the United States fluctuates quite a lot in different elections. Fig. 3 shows that in recent years, about 60% (and even less) of the voting-eligible population votes during presidential election years, while about 40% cast a ballot in the midterms. In the previous election cycle (2012-2014), the gap in voter turnout between presidential and midterm elections was 21.5 points, while the average turnout gap for the whole period in the data (1850-2016) is 15 percentage points. Fig. 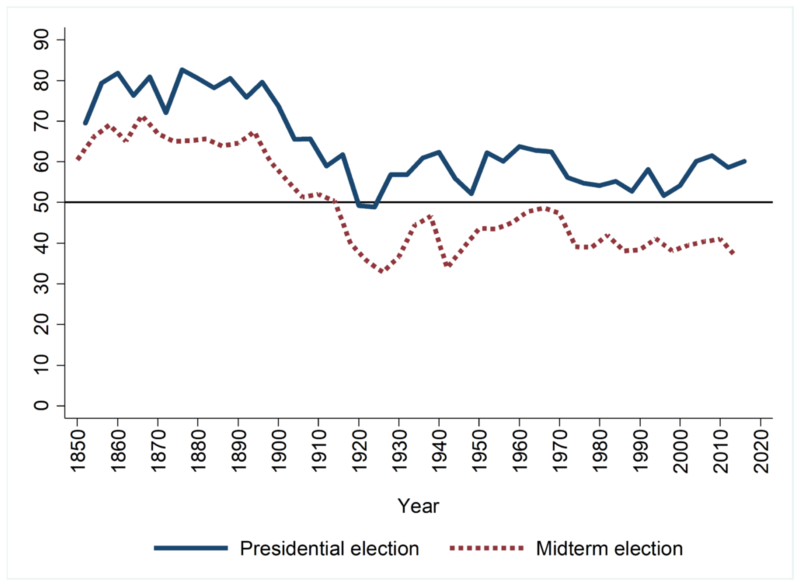 3 Voter turnout in U.S. Presidential and Midterm elections, 1850-2016 Source: Authors’ own compilation based on data provided by the United States Elections Project. In any case, variation in voter turnout will play a crucial role in the 2018 midterm elections. As can be observed in Fig. 4, there exists a (weak) correlation between the forecasted margin of victory in the Senate races and the predicted level of turnout. In many battleground states where the margin is about 10 percentage points, the forecasted voter turnout is much above the 50 percent threshold. For instance, in Nevada, Florida, Montana, Wisconsin and North Dakota – all very competitive races – the predicted turnout is between 50 and 60 percent of the voting-eligible population. Nevertheless, it is also worth noting that there are many Senate elections in which, despite the low level of predicted competitiveness, forecasted voter turnout reaches very high numbers. In most of these cases (Minnesota, Massachusetts, Michigan, Connecticut, Vermont, Wyoming etc. ), the Democrats have a significant lead over the Republicans. This trend can be explained by the stronger mobilization effort carried out by the Democratic Party and their candidates, in particular among the younger electorate. Fig. 4 Forecasted voter turnout and forecasted margin of victory in the 2018 midterm elections, by Senate races Source: Authors’ own compilation on the basis of the forecasting model elaborated in the website fivethirtyeight.com/. Republicans and Democrats consistently disagree on a vast number of political issues. In the past few months alone, the two sides have bitterly fought over issues from agriculture policy to college tuition costs to gun-ownership rights. However, their campaigns are focusing in on a very small number of issues that they think will get people to vote in their favor. This, in effect, simplifies the campaign to just a few points. The Republican message focuses predominately on two things: healthcare and taxes. The Democrats, however, are just talking about healthcare. We can see this through advertisement data collected by researchers at Wesleyan University and reported in Tables 2 and 3. Tab. 2 Top five issues/mentions in US Senate advertising, from September 4 to October 25, 2018. Source: Kantar Media/Cmag with analysis by the Wesleyan Media Project. Note: Numbers include ads on broadcast television. Tab. 3 Top five issues/mentions in US House advertising, from September 4 to October 25, 2018. Source: See Table 2. This data looks at all the ads run for races in the House and Senate and tracks the frequency in which a topic appears. In both House and Senate advertisements, one can clearly see that Democrats prefer to talk about healthcare. It was their party that passed the first ever version of universal healthcare in the United States under former-President Obama, and it is also their party that was barely able to defend it from repeal (with the help of 2 Senate Republicans) in 2017. The American public currently has a more-favorable-than-not view on government involvement with healthcare. A recent Gallup poll shows that 56% of Americans prefer government involvement, as opposed to 42% who do not. 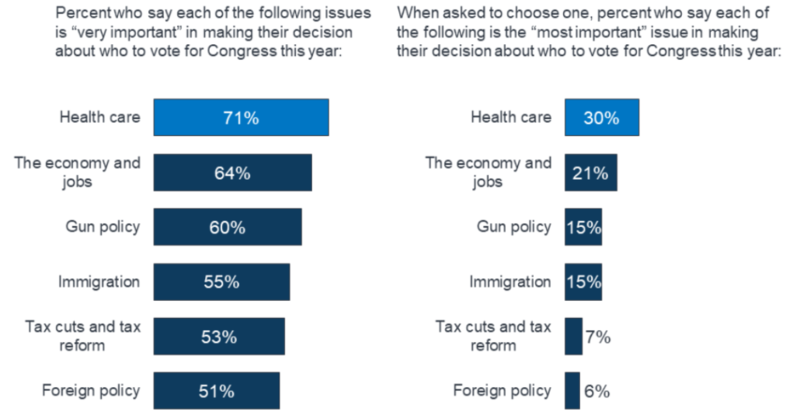 In addition to its favorability, a Kaiser Foundation poll conducted on October 18 found that healthcare is the top issue for voters in this election – 71% of respondents said that healthcare was “very important”, followed by the economy, down at 64% (see Fig. 5). Fig. 5 Most important issues for the voters in the midterm elections, % Source: KFF Election Tracking Poll (conducted September 19-October 2, 2018). Note: Questions asked of and reported among total registered voters. With healthcare being both favorable and the most important issue important to voters, Democrats are using their positive record on health policy to appeal to the nation. Republicans, on the other hand, are having to play defense. Republicans, especially Donald Trump, have been extremely critical of Obama’s universal healthcare. In 2017, they came just one Senate vote short of repealing the program completely. As recently as October 17, 2018, top Republican Mitch McConnell was quoted saying that if Republicans keep control in the midterms, that they may revisit repealing healthcare. Throughout the past few weeks, Republicans have been running ads and making statements promising that they will force insurance companies to cover people with pre-existing conditions. Trump himself tweeted about the issue multiple times in October saying that he is in “total support” of keeping those protections. However, the Trump administration is currently fighting against protections for pre-existing conditions in court. The repeal bill that passed the House and nearly passed the Senate in 2017 would have taken away the protections as well. Republicans are clearly out of favor when it comes to healthcare, and the ads that they are running (second most mentions in Republican House and Senate ads) show that they are trying to play defense on the issue to win back voters. Tax reform is the only other major talking point according to the advertising data. Tax reform was the biggest achievement of the fully-Republican government of the last two years. Republicans in the House and especially the Senate, where 41% of airings mention taxes, are trying to show that they can pass meaningful conservative legislation when are in power. These ads are meant to fire up their base and get them to vote in order to see more sweeping conservative policy. An well-known American data-science and media company – FiveThirtyEight – has developed extensive forecasts for the House and Senate races. Their methodology in forecasting these races is quite complex, and their data is diversified among several sources for each race. Each race is individually given a rating. This means that the candidates are assigned their own odds of winning. The individual odds of each race are then put together into one conglomerate (House and Senate are two separate models). In each model, a normal distribution takes shape, showing us the likelihood of every single seat outcome. To rate each individual race, these models collect all credible polls that have been taken of the district (statewide polls for Senate). They then weight the impact of each poll based on factors such as recency, history of bias, and effective polling methods. After weighting all polls, they produce a weighted poll average, and this is what they use in their forecast. They then compare weighted poll averages in the district to other similar districts, as races with similar demographics and characteristics tend to all vote the same way on election day. They take these comparisons and adjust weighted polls accordingly. Lastly, non-polling factors are considered. These include the incumbents margin of victory in their last election, the generic congressional ballot margin, fundraising, district’s partisan lean, congressional approval ratings, etc. Each non-polling factor is given its predicted impact on the votes, and then combined with the weighted poll average to produce the odds that each candidate will win. When all ratings from each race across the country are combined, the topline numbers say that Democrats have a 85 percent chance of winning the house and Republicans have a 85 percent chance of keeping the Senate. Fig. 6 Forecasting the race for the House Source: https://projects.fivethirtyeight.com/2018-midterm-election-forecast/house/?ex_cid=midterms-header. Fig. 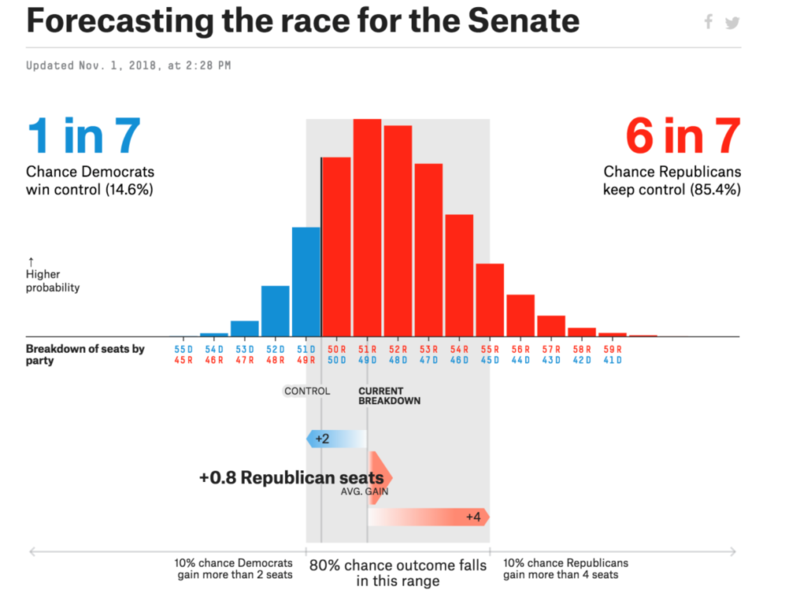 7 Forecasting the race for the Senate Source: https://projects.fivethirtyeight.com/2018-midterm-election-forecast/senate/?ex_cid=rrpromo). Forecasting: Analysis, What Races Should I Be Watching? The generic ballot poll-composition (also done by FiveThirtyEight, predicting the aggregate popular vote of all races) gives the Democrats about an 8% lead in nationwide voter turnout. 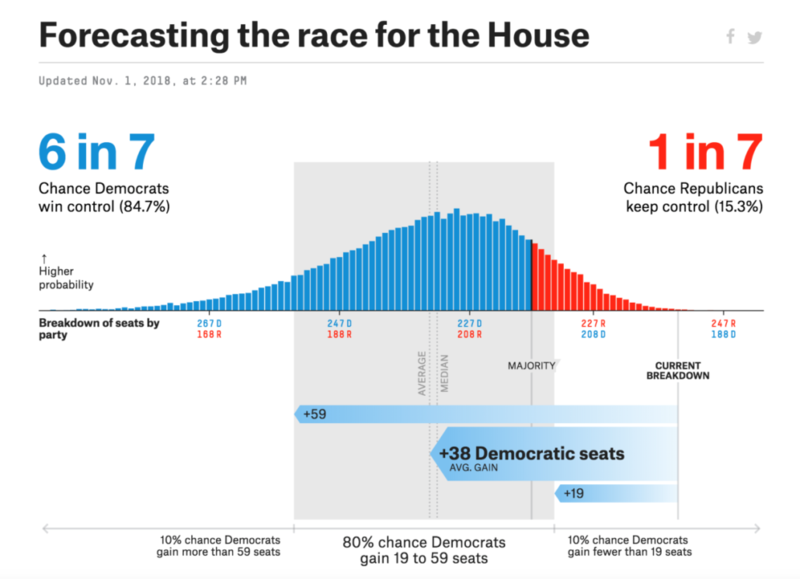 The House model accurately reflects this as there is a greater than 99.9% chance that the Democrats will pick up at least one seat in the House. The large Democrat advantage on the generic ballot, however, does not show in the Senate model. The reason for this is that out of the 35 Senate seats up for election, 26 are Democratic, and only 9 are Republican. The Democrats need to flip 2 Senate seats for a majority, while defending all of their existing seats. Defending their existing seats seems unlikely though, as one of them is a tossup (Missouri), and the other is now classified as likely Republican (North Dakota). The most realistic path to a Democratic win in the Senate would be to win all three tossups (Nevada, Arizona, and Missouri), while also taking one ‘likely Republican’ seat (Texas, North Dakota, Mississippi, or Tennessee). So on November 6, certainly watch the three Senate ‘tossups’, and check the four ‘likely Republican’ seats. If one of the tossups is going poorly, or all of the likely Republican seats look more like solid Republican seats, then you can safely assume that Democrats will fail to flip the Senate. Fig. 8 Forecasted vote-share and margin of victory (percentage points) Source: Authors’ own compilation based on the FiveThrtiyEight’s Senate model. As for what you should watch in the House on election night, it is harder to say. Individual races do not have as big of an impact when there is 435 of them. The best advice would be to watch for trends. First: High voter turnout will be positive for Democrats in tight races. Low voter turnout helps the Republicans. Second: Races in districts with similar demographics and characteristics will typically fall the same way, as party messaging normally is the same across districts. For example, if one or two midwestern districts with a lot of blue-collar workers start falling to the Democrats, expect more of the same throughout the night. Third: Watch, and take note of the House races in the state of Pennsylvania, as it could be indicative of a nationwide trend in the 2020 House elections. After the 2016 election, Pennsylvania’s districts were redrawn by court order, as a judge found that the districts were gerrymandered in a way that favored Republicans. With new and fair districts, Democrats could possibly flip around 22% of the entire state’s representation in their favor. All 50 states will re-draw their congressional districts in 2020 (it is done every ten years to keep representation equally spread amongst changing populations). If (anti-)gerrymandering rules are more strictly enforced during the upcoming redistricting, we may see seat-shifts similar to Pennsylvania’s in future congressional elections. So, watch Pennsylvania for a taste of what the 2020 election may bring. Congressional control hangs in the balance. The Democrats’ progressive stance on universal healthcare seems to be resonating with the nation, as the popular vote across all congressional elections is predicted to favor the Democrats by 8%. However, when we apply this to different electoral playing fields in the House and the Senate, we see a split in projected outcomes. The Democrats have a 85 percent chance of taking back the House, and Republicans have a 85 percent chance of keeping their majority in the Senate. These odds, while looking hard to overcome, leave little, but significant, room for either party to win both contests. In our most likely case-scenario, where Congress ends up being split between the two parties, Democrats should feel relieved. After two years of Trump’s right-wing control, Democrats should at least be able to force the Republicans to compromise on legislation. And for all those who voted Democrat because of the healthcare issue, they can consider universal healthcare to be saved from a potential repeal attempt. Nothing is guaranteed yet though, and the models will not get any more certain than they are now. So we will have to wait and see what happens on November 6.